Al Hajjaj offers free Hajj and Umrah services to the poor. Although pilgrimage to Mecca to perform Hajj is obligatory for all Muslims, Allah SWT has also stated that Hajj is only obligatory for those who can afford it. None the less millions of poor Muslims around the world have a desire to visit the House of Allah (SWT) to perform their duty as a Muslim. Why should a poor person be denied the right to perform their obligations as a Muslim? We're living at a time where many millions of muslims around the world have been blessed with wealth. We invite these Muslims to contribute towards or pay for their brothers and sisters who are less fortunate to perform Hajj. The majority of scholars have all agreed that any person who qualifies to receive Zakat or Sadaqa can use those funds how they wish for halal purposes such as performing Hajj. In 2017 we sent 11 people for Hajj and 1 person for Umrah. In 2018 we have so far sent 1 person for Umrah during Ramadan. In addition we have also raised enough money to send 7 people for Hajj in 2018. This includes 5 people from slums in Kenya, 1 poor labourer from Nigeria and a brother in a wheelchair with cerebal palsy from the UK. -A 61 year old refugee with no family who lives in a Masjid in Leicester. He looks after the mosque as a volunteer & suffers from Post Traumatic Stress Disorder. -A number of elderly men in their 70's who have no family & no income and who live alone. -A 78 year old man who has never married and has no children. He lives in a single shared room and is heavily in debt. He has a desire to perform Hajj before it is too late. Al Hajjaj carefully interviews and selects people from poor backgrounds from all around the world to ensure that they are genuine people and most importantly that they are zakat eligible. Once the appropriate funds have been raised we pay for all of the expenses associated with that person's trip to the house of Allah (SWT). These include airline tickets, costs of getting visas, passports, vaccinations, transportation, food, accommodation, transfers between Mecca and Medina costs of staying in Mina, Qurbani costs and all other small costs that they may incur. 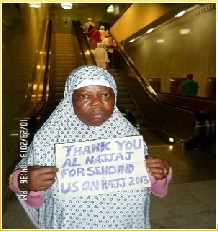 We even give the Hajjis spending money while they are there. We offer a totally free Hajj package to the poor. 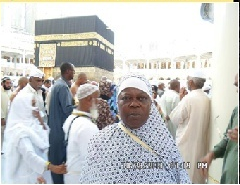 We have a network of sub agents across the world whose job it is to arrange cheap Hajj packages for the poor people we have chosen to take for Hajj. The money you pass to us is then used to pay for these packages and all other associated costs. Our aim is to make the process totally free for them. Our activities are completely transparent and we have a 100% donation policy. On request we can provide conclusive evidence that shows how funds are appropriated. This includes photo's of the Haji's in Saudi Arabia and receipts for their Hajj packages. Please view our gallery for some example photographs. Should you need additional information then please do not hesitate to contact us.